Modern Flames introduces the FusionFire™ Steam Fireplace, the next step in the company’s revolutionary line of innovative fireplace products. Modern Flames harness the power of commercial steam flame technology seen in the likes of Disney and Universal Studio with its revolutionary FusionFire™ Steam Fireplace. The FusionFire™ Steam Fireplace was designed to handle the rigors of everyday use and consumes extremely small amounts of water when running. Because it is safe to touch and uses clean steam energy, no clearance is required for builders or homeowner. 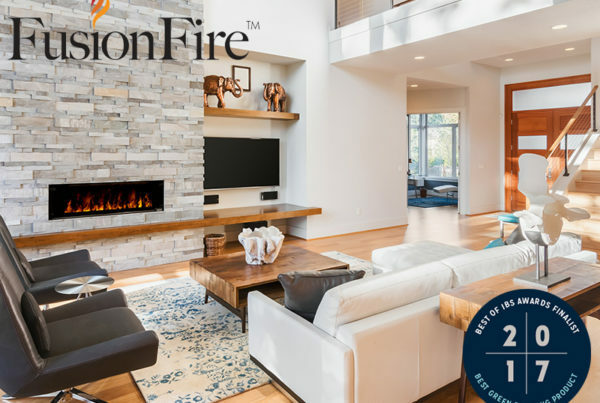 Requiring only 120v of electricity, home builders who are struggling to install gas fireplaces to meet the rigid parameters of modern green building codes (the new “Net Zero” requirements) should look no further than the FusionFire™ Steam Fireplace. Featuring the most life-like flame ever developed, this steam-based unit will be the first fireplace on the market that provides the consumer with the best aspects of both gas and electric, opening the door for a host of residential and commercial applications.